The president’s travel ban for people from seven Muslim countries (now temporarily suspended by federal judges) has provoked outcries from the liberal community in the United States. Rallies and other acts of dissent have sprung up in most major cities. I last wrote about the response to the travel ban in the general Jewish community. I now seek to learn more from Jews who have lived in Muslim countries. “In just 50 years, almost a million Jews, whose communities stretch back up to 3,000 years, have been ‘ethnically cleansed’ from ten Arab countries. These refugees outnumber the Palestinian refugees … , but their narrative has all but been ignored. 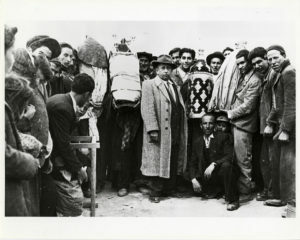 Unlike Palestinian refugees, they fled not war, but systematic persecution,” according to Point of No Return, a blog on Jewish refugees from the Middle East. Rabbi Albert Gabbai of Mikveh Israel is one of these Jewish refugees, and he has an amazing story that many American Jews do not know: Rabbi Gabbai was originally from Egypt. With the outbreak of the Six-Day War, Egypt rounded up all the Jewish men and put them into prison camps. (I recall learning in an earlier conversation with him that his mother brought food to the prison daily because he and his brothers did not get kosher prison rations.) Three years later, he was driven to the airport. He was given a French laissez-passer (travel document), and he arrived in Paris, with just the shirt on his back. I could have spent much more time learning about his personal story, but our conversation diverged into his views on Muslim immigration in America. I also had the opportunity to interview two Jews from Iran. One was Ephraim Dardashti, who left Iran before the Revolution of 1979. The other, DD, who prefers to remain anonymous, left Iran after the Revolution. Below are my questions, with responses from Rabbi Gabbai and the two Iranian-born Jews. How was life in your native land? DD: In Iran, by 1979, most of the Jewish community had moved out of the Jewish ghetto. I’m the third child in my family and the first one that was born outside the ghetto. Jews had started to excel both academically and financially. There was still a great deal of anti-Semitism and overt discrimination all around. The hostility took a sharp turn for the worse starting in 1978. ED: During the reign of the Shah, the Jews were overall well-off at the time. They had economic and educational opportunities that were unprecedented. The ruling regime wanted to move the country to the modern age and leave the Middle Ages behind as quickly as possible. The Jews took advantage of this opportunity, and as result, were far over-represented in the professions and in the economic life of the country. The socio-religious prejudices were below the surface, but they never disappeared despite the assimilation of the Jews into the society at large. Shiite Iran and pre-Islamic Zoroastrian Iran had a long checkered history when it came to the treatment of the Jews. Prior to the 20th century, there were frequent violent outbursts against the Jews and forced conversions. The Jewish community was battered. Missionaries and the religion of Bahaism made strong inroads among the Jews in the 19th century. What is it like now? Is there still a Jewish community? DD: There is still a Jewish community in my hometown of Shiraz, although it has shrunk quite a bit. The Jewish school is controlled by the government, with a Muslim administration, and the school is required to operate on Shabbat. The Jewish education books are issued by the government and taught in Farsi. The contents have a Muslim slant. Jews are excluded from positions of authority and certain professions. ED: At the time of the Islamic Revolution, the population of Iran was 35 million; the Jews numbered around 125,000. Today, the population of the country is around 80 million, and the Jewish population numbers around 20,000. I think that the numbers speak for themselves. HL: According to Professor Joel Beinin of Stanford University in The Dispersion of Egyptian Jewry, at most, less than ten Jews remain in Egypt today. What is your view on the United States welcoming Muslim refugees? AG: As Jews, we welcome people who are persecuted. As Jews, we have to protect ourselves. As Jews, we have to follow the law of the land: dina d’malkhuta dina (Aramaic: דִּינָא דְּמַלְכוּתָא דִּינָא‎‎). The guiding principle should be that whoever comes here is not here to harm us. As a Jew who was persecuted for his faith and ethnicity, I sympathize much with people who were persecuted, despite being innocent of any crimes. We are always guided by our Jewish principles. The laws of Maimonides for tzedakah (charity) direct us to focus first on our inner circle – the family – before we address the needs of the community. We cannot solve the problems of the whole world. Millions want to come here for a better life. We’re not being honest with ourselves if we don’t admit that. Syrians have fled to Turkey and Jordan. They’re not being killed there. The United States can send them money, medicine and blankets. It does not make sense to bring them here. We should not discriminate between Christians and Muslims, black and other, when we’re talking about saving people whose lives are in danger. What are your thoughts on the impact of Muslim refugees on American society? AG: Germany allowed entry to close to one million Muslims. Most are not from Syria, but are from Pakistan, Afghanistan and Africa. About 80-90% of these people are able-bodied young people, who are not escaping from war, but choosing a better life. They do not care for assimilation. They live in enclaves, in suburbs such as outside Paris. They cannot afford to live elsewhere. This complicates the problem of assimilation and fosters radicalization. These are police “no go” zones. Muslim community peer pressure enforces a rigid form of piety. DD: I think Islam, at least the way it is taught in almost all Muslim countries, is the problem, not the Muslims. I’m more concerned about the Muslim schools and mosques, mostly funded by Saudi Arabia, that indoctrinate the followers with Islamic supremacist, anti-Semitic and anti-Western ideology. I have an employee who is a Muslim from India who was confiding to me that he could not find a mosque that followed the moderate version that he was used to in India. I do think that American citizenship requires acceptance of American law. I was catching a flight back from Detroit a few months ago, and I was stuck behind a Muslim lady who was trying to board with a full niqab (a full-body covering, with only the eyes visible). I think requiring that level of acceptance in America is unreasonable. ED: The problem facing Europe and the U.S. has fundamentally to do with the nature of Islam. Islam had a golden period in the Middle Ages: the sciences, mathematics and medicine coming out of the vast Islamic lands were far superior to anything comparable in Medieval Europe. But, Islamic societies have hit the wall. A glorious past, but nothing to show these days despite its oil wealth in parts of the Islamic world. The Islamic world resembles a person who has a glorious lineage, but he or she today has nothing to show for it. The Islamic lands have tried all the “isms” out there — socialism, nationalism, communism and capitalism — yet they are behind in every facet. Does the resettlement of Muslims differ between the United States and Europe? DD: I’m a bit conflicted. On the one hand, being an Orthodox Jew, I understand the desire to maintain one’s cultural identity. On the other hand, we Jews, or other similar groups such as the Amish, do not try to impose our way of life on others or resort to violence if our religious sensitivities are offended. I think the U.S. has been somewhat more successful than Europe in absorbing Muslims. Having experienced the indoctrination that goes on in Muslim countries — having attended a public school — I think there is a clash of civilizations. That said, many Muslims who are trying to migrate to the U.S. and Europe are also escaping the repressive culture. We somehow need to be open to the moderate Muslims and those escaping repression, while fighting the Islamic supremacist ideology, including the institutions and people that promote it here. ED: These societies are imploding as demonstrated by the Arab Spring. Folks are fleeing them and moving to the heartlands of nations that colonized them in the past, or others, like the U.S. and Canada, that have sheltered them. In Europe overall, immigrants from Islamic lands are reminded on a daily basis — by self-comparison — how backward they are. Those coming from male-dominated cultures are baffled by the sexual morality of their adopted countries, freedom of thought and generational gaps. In Europe, as well as in their home countries, the elixir for all the miseries and jealousy has been a return to a misunderstood and over-glorified past. If only Shariah and Koranic rule were in place, then they would be back as great or greater than their glorious ancestors. Islam has to confront itself and modernize. The Jews have done that successfully over the ages. The frustrated, damaged “refugee” clinging to the unreformed Islam of his ancestors is a time bomb, as demonstrated in Paris, Brussels, Tunisia and elsewhere. Iranians represent the largest non-American ethnic group in the ranks of professors in American colleges and universities. These are the children of the “westernized” and secularized Iranians dating back to the advances under the Pahlavi regime. This is not about immigration or refugee resettlement, but rather about time-traveling — folks moving from the Middle Ages to the 21st century and their ability to adapt. Eastern Jews made the leap when they moved to Israel. Vietnamese, Laotian and Cambodian refugees adapted. The Muslim communities sending their kids to madrassas in Minnesota, California, Michigan, New York and Tennessee haven’t, and they are ticking time bombs. The problem is Islam being stuck in the mud of the Middle Ages and dragging into the earth those clinging to that version of it. Political correctness and the mediocre state of “liberal” education and the fact that we see everything from the prism of the 60’s racial-equality battles have robbed us of the ability to think and analyze. The problem is not immigration or refugee resettlement, but rather a poisoned and dying Islam that, unless it reforms itself, will take down its own adherents and those they come in contact with. AG: Here, when you ask for directions in accented English, people go out of their way to help, even if by giving erroneous directions. While social media fixates on the latest outrage over an iconic photo of a child washed ashore, Judi Bernstein-Baker has put in 18 years at the helm of an organization that has been assisting refugees for 134 years. She led a small staff, funded by Jewish Federation to resettle Jews from Eastern Europe, and grew it into a multilingual, groundbreaking institution. “Before, we helped Jewish refugees. Now, we help refugees because we’re Jewish,” Judi proudly declared at the farewell luncheon on Wednesday. True to her passion for her work, she declined a gala event in favor of the annual luncheon honoring many others for their work. During her tenure, HIAS PA (formerly Hebrew Immigrant Aid Society) has served over 36,000 refugees from over 100 countries. In 2002, it established the Asylee Outreach Project, which remains the only program of its kind in Pennsylvania. It expanded its Immigrant Youth Advocacy Initiative in response to the influx of unaccompanied minors from Central America, some as young as two. It is part of the Philadelphia Partnership for Resilience to assist survivors of torture and the Victims of Interpersonal Violence Initiative to promote healing and self-reliance for victims of domestic violence, human trafficking, and other violent crimes. Among the people honored at the event were Michael Matza for his courageous coverage of migration issues at the Inquirer and Helen Gym, Councilwoman at Large, for her passionate championship of the segments of the population who are marginalized from skilled care and public resources. It concluded with remarks by Cathryn Miller-Wilson, the incoming Executive Director. How did Judi come by her passion? According to long-time board member, Adele Lipton, it was in Judi’s genes. Both of their mothers came as young girls, at age 14 and 15, from Poland, arriving on steerage. They were both greeted by HIAS. They were both told repeatedly by their mothers, that if it were not for HIAS, they would not be alive now. In 1939, quoted Judi from HIAS archives, two-thirds of Americans wanted no more refugees, including the 10,000 children awaiting visas from Eastern Europe. Now, we have governors and presidential candidates who want to close our borders. Last month, HIAS PA resettled 53 refugees. It is a world that is worse off for many people, with 60 million people displaced from their homes. Do you make New Year’s resolutions, and are they like “piecrust promises” — as Mary Poppins says — and easily broken? If so, you should know that the paperback edition of The Power of Habit: Why We Do What We Do in Life and Business, by the New York Times reporter, Charles Duhigg, will be released on January 7th. In the book, Duhigg teaches techniques to free oneself from damaging habits, whether with health, diet, or finances. First, there is a cue that tells your brain to go into automatic mode. Then, there is the routine. And finally, a reward, which helps your brain learn to crave the behavior. For instance, studies indicate that if you want to develop a running habit in 2014, you should choose a cue, like putting your running shoes next to your bed. And then, give yourself a reward, like a piece of chocolate, when you get home from jogging. That way, the cue and the reward become neurologically intertwined. Eventually, when your brain sees the sneakers, it starts craving the chocolate, and that makes it easier to hit the pavement each day. And in a couple of weeks, you won’t need the treat any more — your brain will come to see the workout as a reward itself. The miracle of Israel’s Six-Day War in 1967 united a nation, and Jews all over the world celebrated its victory. That members of the 55th Brigade of paratroopers who reunited Jerusalem then led lives that split its small nation politically as well as religiously is the heartbreaking saga on how we have not merited the Messianic age of global peace, Olam HaBa. While writing this labor of love, Halevi was troubled by the singular lack of voice; he thought it meant the book wasn’t speaking to him. Then in an epiphany, he realized that the cacophony of voices from his interview subjects was what defined himself as an Israeli Jew, one with conflicting views. He then constructed his book with alternating voices, allowing each central character to express his thoughts and views as they evolved over time. He spoke on Sunday before a standing-room audience at Main Point Books in Bryn Mawr. 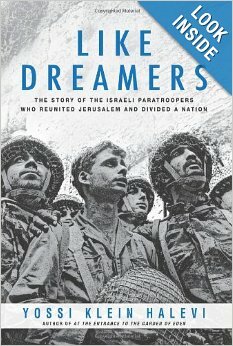 His cast of characters include the kibbutznik paratroopers and the religious Zionist paratroopers. They served together and they exhibited a tremendous level of tolerance and cooperation. One protagonist, the secular commander Arik Achmon, noted how the religious reservists, whom he’d ridiculed as dosim (religious nerds), were keen on proving their worth and how they rose a half hour earlier each day to pray. Once when his soldiers were sent on leave but it was close to sundown that Friday, they chose to stay in camp rather than risk traveling on Shabbat. He noticed approvingly that they didn’t ask to be let out early. He then showed his respect by enforcing the kosher laws in the army kitchens (despite the paratroopers’ sense of being a law unto themselves), so that any soldier under his command would not feel uncomfortable. The disastrous Yom Kippur War of 1973, when Israel was caught ill-prepared and lost over 2,500 men and over 7,000 were wounded, sobered the nation. Some realized that Israel’s survival required moral renewal. Two divergent paths emerged formed by those for whom annexing the territories of Judea and Samaria (captured from Jordan in 1967) was a part of the redemption process and those for whom withdrawing from the territories, termed by them the West Bank, was the hope for peace. The liberators of Jerusalem were amongst the founders of the settler movement and the Peace Now movement. Another of them, Udi Adiv, became so disenchanted with Zionism that he traveled to Damacus in 1972 to create an anti-Zionist terrorist underground. He served 12 years in an Israeli prison. Their narratives will in time coalesce into hardened political positions. On Sunday, Halevi spoke of the two promises of Zionism: normalcy to end anti-Semitism and transcendence to serve as a light unto the world. He sees the most interesting divide as the one from normalcy to utopia. Thus, both the kibbutzniks and the settlers (who wish to populate the whole of Judea and Samaria) are in the same camp as utopians. He then addressed the three failed dreams of Israel: the kibbutz movement, the settler movement, and the Oslo peace accords. 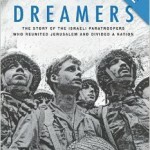 Now Israel is bereft of a utopian dream. Can it sustain itself without one? My rabbi recently spoke about the Torah portion of parshat Vayeshev, in which Joseph is asked to interpret the dreams of his fellow prisoners, the baker and the wine steward. The wine steward whose crime was a fly in the wine being served to the pharaoh was reinstated to his post, while the baker whose bread had a small stone was executed. While a fly might be disgusting, it is not life-threatening, but a pebble would prove a choking hazard. The lesson was that a threat from within could be greater than without. A great challenge for Israelis now is to build unity from amongst their brethren. When they respected each other and were united in their goals in 1967, they achieved miraculous results. May Am Israel re-gain its sense of purpose and harmony and see peace in our times.